From the way things are shaping out, it seems as though that it’s full steam ahead for Dell. We already have seen some of the goodies in store for the smartphone market, but now we’re getting a peek at what they’ve got planned for tablets. 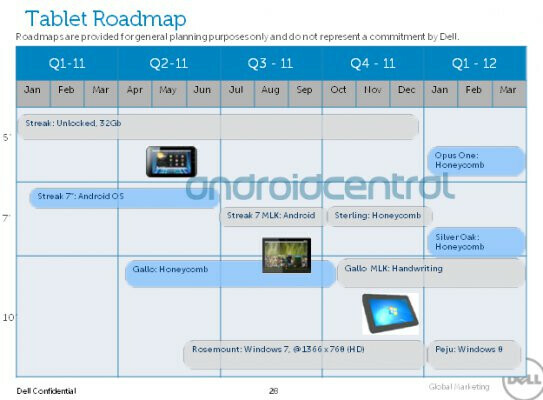 Yet again, we find another leaked slide that shows off Dell’s tablet roadmap – which interestingly mentions some stuff going for 2012 as well. 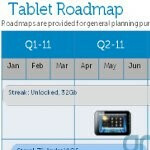 Although there isn’t as much detail in this slide versus what we saw with their smartphone roadmap, it does give us a general time line on when we should expect these tablets. First and foremost, the Dell Gallo appears to be the newest member of their Android tablet family to run Honeycomb – with an expected arrival some time in April. Additionally, it’s set to receive some sort of “Handwriting” update in Q4. Secondly, it’s going to be followed by the Dell Sterling, also running Android Honeycomb, which will be launching around Q4 2011. And finally, we’re finding that the Dell Opus One and Silver Oak will be Honeycomb tablets that will come around early next year – but it’s hard to fathom them running Honeycomb at that point. And if you’ve managed to pick up the Dell Streak 7 of late, don’t think that you’re simply going to be set aside because of these new tablets. In fact, the Dell Streak 7 is positioned to receive some sort of update in Q3 – but there is no specific regarding its content. Not to be outdone, we also find the Dell Rosemount which will be a Windows 7 tablet that packs a resolution of 1366 x 768. Based on the roadmap, this one will be arriving around the end of Q2. Last, but certainly not least, we have the Dell Peju penned as being a Windows 8 tablet that will be arriving next year.